It’s not just pints they serve at Mulligan’s – they have spirits too. JOHN MULLIGAN’S PUB in Dublin serves plenty of spirits over the bar but the people who work there claim it boast some other spirits, some punters who make things go bump in the night. The 230-year-old pub on Poolbeg Street is perhaps most famous for its association with James Joyce, who set one of his short stories on the premises. The bar staff at Mulligan’s have some of their own – sometimes spooky – tales to tell, however. Declan Dunne has written a book about the colourful history of the bar, which was host to many entertainers and performers over the years because of its location close to the Theatre Royal. Judy Garland drank there seven nights a week when she performed at the theatre, smoking and playing poker until the early hours. Though the regulars who drink at the pub scoff at the idea of it being haunted, Dunne said the barmen who spoke to him really believe the things they have seen over the years. His brother, Brian, began working in the pub in the 1990s as he was studying for a law degree. He and Gary were working in the front lounge bar when Gary felt and heard a knock from beneath the cellar hatch on which they were both standing. They knew there was no one in the cellar. Gary turned to Brian to ask him if he had noticed anything. Brian had heard and felt the same rap from the hatch. They both waited a while, afraid to check the source of the noise as they laughed nervously. Eventually, Gary opened the hatch and checked the cellar. There was no one there. Their colleague Christy Hynes also experienced some strange things in the bar in the early 1990s. He once left down a bucket beside him only to find that when he turned to pick it up again, it had moved to the other end of the cellar. On another third occasion, he was sitting in the lounge at the end of a night when he looked into the bar area and saw a figure walking by. He went to investigate because the pub was closed but could find no one. A full decade after this, another barman, Danny Tracey was enjoying a drink with a friend after closing time and they also saw a male figure passing through the front bar. Again, when they went to look, there was nobody there. 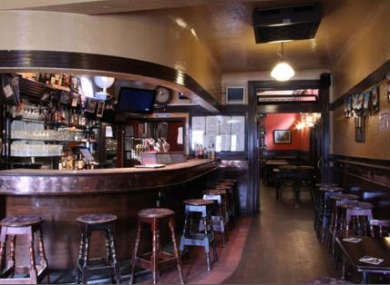 Dunne said he has not been able to find anything in the history of the pub to suggest anyone ever died there. “Someone said to me recently that the only thing they do in Mulligan’s is character assassination,” he joked. His book Mulligan’s – Grand Old Pub of Poolbeg Street is available in most book stores and online. Email “Phantom footsteps and flying bottles: Ghost stories from Dublin's John Mulligan's pub”. Feedback on “Phantom footsteps and flying bottles: Ghost stories from Dublin's John Mulligan's pub”.